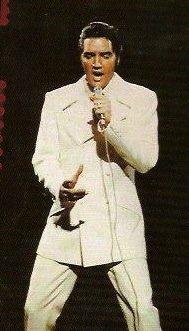 Elvis sang “America the Beautiful” during many of his concerts from 1975-1977. A recording made during his show at the Las Vegas Hilton on December 13, 1975, was released as a single in 1977. It was an expression of his patriotism, which he also demonstrated in other ways, most notably in a letter to President Richard Nixon on December 20, 1971. It would seem likely, then, that the Fourth of July, the most patriotic of all American holidays, would have had special meaning for Elvis. We can’t know the emotions that he felt on Independence Day each year, but, thanks to Peter Guralnick and Ernst Jorgensen’s book, Elvis: Day by Day, we do have some idea what he was doing each year on that annual summer holiday. Starting with 1954, here's a look at where Elvis was and what he was doing on some of the July 4ths of his life. For 19-year-0ld Elvis, this holiday turned out to be one of the most important days in his life. At Sam Phillips’s suggestion, Elvis got together with Scotty Moore and Bill Black at Scotty’s house in Memphis to sing some songs so that the two musicians could assess Elvis’s talent. Although neither Scotty nor Bill was greatly impressed with Elvis’s singing, it was decided to see what he sounded like in Sam’s recording studio the next day. Music history was made that day at a “rehearsal” session in Sam Phillips's studio. It was a hectic Independence Day for Elvis. He made personal appearances this day in three separate Texas communities—De Leon, Stephenville, and Brownwood. They were among about 200 live shows he had performed with Scotty and Bill in the year since they first met. Sun Records had released Elvis’s first four single records, with a fifth due out in August. It had been a busy year for Elvis, but he could never have guessed how far he would go before another Independence Day rolled around. Arriving home in Memphis after appearing on the Steve Allen Show in New York City on July 1, Elvis spent the holiday with his family at the Audubon Drive home he had purchased. With his girlfriend Barbara Hearn present, he played for them the acetate of “Don’t Be Cruel,” which he had recorded at RCA’s New York studios two days before. In the past year Elvis had signed with RCA, had a #1 record with “Heartbreak Hotel,” and appeared on national television nine times. It became a sad Independence Day for Elvis when he learned that morning that Judy Tyler, his leading lady in the just completed Jailhouse Rock, had died in an automobile crash in Wyoming the day before. An emotional Elvis spent the day remembering Tyler with his friend, Memphis DJ George Klein. Elvis’s “All Shook Up” was #6 on Billboard’s Top 100, after previously spending 8 weeks at #1. “Teddy Bear” was at #4, on it’s way to spending 7 weeks at #1 that summer. 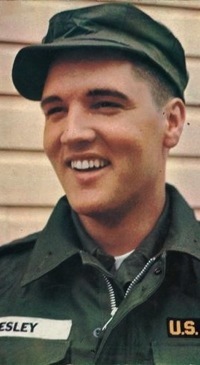 Having completed basic training, Elvis is stationed at Fort Hood, Texas, awaiting his deployment to Germany. Elvis shares a rented house off base with his parents, his grandmother Minnie, cousins Gene and Junior Smith, and friend Lamar Fike. His fourth film, King Creole, had opened in theaters nationwide two days before. On this Fourth of July, Elvis could feel some pride that he was serving his country, but more than likely a stronger emotion this day was anxiety he felt about his entertainment career and fear that his fans would forget him while he was away in the army. During the sixties, Elvis was usually at home in Memphis for Independence Day. In 1964, though, he spent the entire month of July in Hollywood filming his 17th film, Girl Happy. Elvis can reflect on a couple of recent major changes in his life. He is now a father, with Lisa Marie just five months old on her first Independence Day. 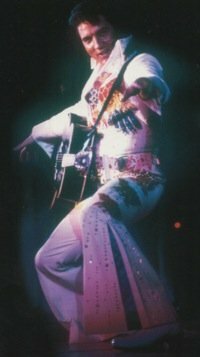 Just a few days before, on June 30, Elvis completed filming of his NBC TV program, which would become known as his “Comeback Special” when it airs in December. Also on this Fourth of July, Elvis’s 1964 Rolls Royce is auctioned off to benefit a children’s charity. A nervous and excited Elvis prepares to leave Memphis for Los Angeles to begin rehearsals for his return to live performances at the end of the month at the International Hotel in Las Vegas. “In the Ghetto” was at #7 in Billboard’s current Hot 100 list. After the annual evening fireworks display/war at Graceland, Elvis and the guys spend the rest of the night at the Crosstown theater watching two films—Williard and an Italian horror film, The Cat o’ Nine Tails. The next day Elvis will leave for Los Angeles to start rehearsals for an engagement at the Sahara Tahoe beginning on July 20. Elvis returns to Memphis from Atlanta after completing a 10-day tour. He looks forward to Lisa Marie’s summer visit and plans are made for him to stay in town for a recording session at Stax, a studio renowned for its rhythm and blues recordings. Back home in Memphis after an eighteen-day tour, Elvis gives a lecture and demonstration at his newly established Tennessee Karate Institute. 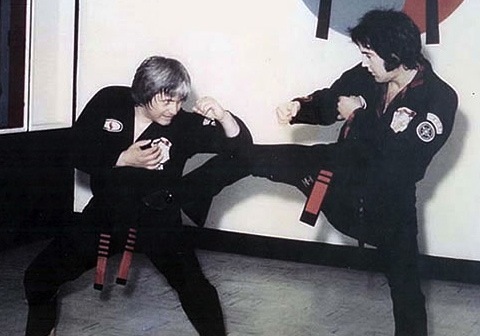 The school is part of Elvis’s recent commitment to the discipline of Karate, something he has practiced off and on since his army years. Elvis spends the final Independence Day of his life in seclusion upstairs at Graceland. Charlie Hodge, Billy Smith, and his wife Jo are regular visitors, and girlfriend Ginger Alden comes and goes. Otherwise, Elvis sees few others until Lisa Marie is due to arrive for a two-week visit at the end of the month. 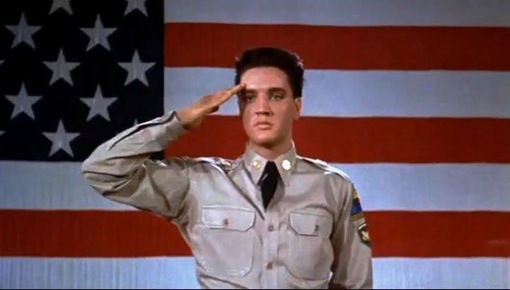 The review of the Fourth of July in Elvis Presley’s life reveals a couple of themes. First, in common with most Americans, Independence Day was usually a day off work for Elvis. Only twice in his career did he perform on stage on that date. On a couple of other occasions, he was on a movie set on the Fourth, but usually it was a holiday for him to relax at home in Memphis. 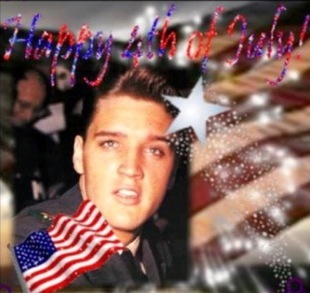 "Elvis spent the Fourth of July doing many of the things most Americans do on Independence Day. It’s just that sometimes he did those things in a bigger and flashier way than the rest of us."